Swelling is your body’s natural response to an injury. Despite the number of precautions you may take, injuries can happen at any time and any place. You could be walking down the road and you accidentally twist your foot, or you could be trying to lift a heavy bag and injure your arm in the process. Swelling happens whenever your skin, organ, or other parts of the body enlarge as a result of fluid buildup. Swelling is one of the body’s inflammatory response to injury and has a protective value. The excess fluid protects the tissues from further injury and aids in the healing process. Swelling resulting from injury can be quite painful and requires immediate action to prevent further damage. Tips to Reduce Swelling From an Injury. Excessive swelling accompanied by other symptoms, such as the inability to move the swollen part of the body or intense pain, calls for immediate medical attention. Also, if the swelling doesn’t subside in 72 hours and the pain remains at the same intensity, then consult your doctor as any delay in reducing the swelling may lead to other complications. You can prevent excessive swelling by starting immediate treatment. Many natural remedies can be used to prevent or reduce swelling due to an injury. Here are some home remedies for swelling from an injury. To ensure a quick reduction of swelling caused by an injury, you need to allow the injured area to rest as much as possible for the first 24 to 72 hours. Proper rest is a key component in repairing soft tissue damage that often occurs with minor injuries. By contrast, straining the injured area will cause more swelling, pain, and delayed healing. If you have an injured foot or ankle, consider using crutches to take the pressure off the swollen area. If you have an injured arm, use the other arm to perform tasks or ask for help from others. In the first 72 hours following an acute injury, applying a cold compress is one of the best ways to minimize swelling. Cold therapy reduces the blood flow in the injured area, consequently inhibiting the accumulation of excess fluid and, hence, swelling. It also decreases muscle spasm and metabolic demand and promotes speedy functional recovery. The cold temperature offers a numbing effect on the nerves, which in turn plays a key role in pain reduction. Apply this pack on the affected area for 10 minutes. Instead of ice cubes, you can also use a frozen bag of peas to make a cold compress. Note: Do not apply ice directly on the skin, as it may damage the skin or even cause frostbite. Plus, ice is not a suitable treatment option for chronic injuries. 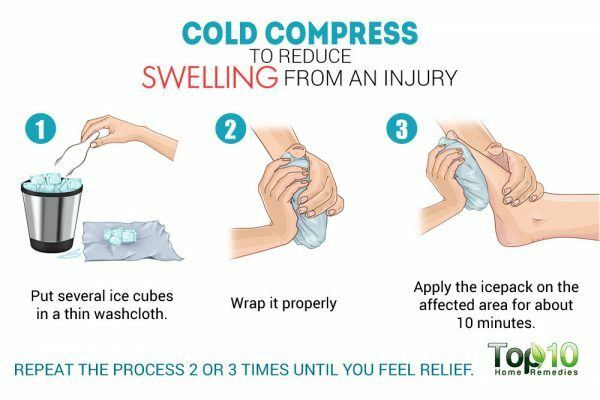 Compressing the injured area is another effective way to reduce swelling. It provides stability and prevents fluid from accumulating in the affected area, which in turn aids in reducing the pain and swelling. 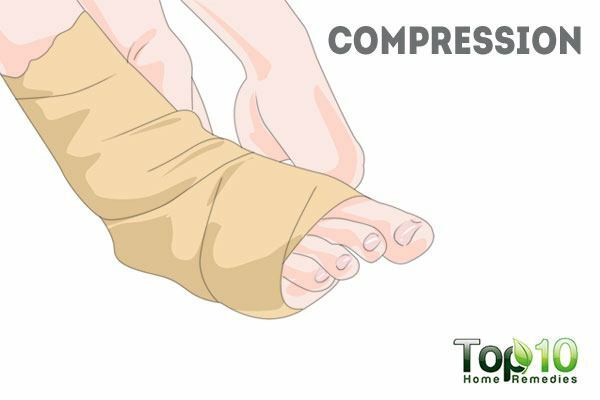 To apply compression, get an ACE bandage wrap or similar elastic bandage from the store. Wrap the bandage using even pressure around the affected area. Note: Do not wrap the bandage too tightly, or else it will hamper proper circulation. Poor circulation worsens swelling in any part of the body after injuries. Elevating the affected area, such as the hand, finger, ankle, or leg, above your chest level can help a lot to reduce swelling. Elevation improves blood circulation, resulting in relief from the discomforts associated with injury, such as swelling, pain, and other signs of inflammation. Elevation also facilitates the elimination of waste products and speeds up the healing process. If your hand or fingers are swollen, you can sit on a sofa, put a few pillows on the armrest, and rest your hand on top of the pillows. While sleeping, place a few pillows under the affected hand or leg to keep them elevated. If necessary, use a sling to keep your arm or leg elevated. Epsom salt is a great help when it comes to reducing swelling and pain after an injury. Made up of magnesium sulfate, Epsom salt helps improve blood circulation and relaxes stressed muscles. You can start using Epsom salt 48 hours after the injury has occurred. Mix 2 tablespoons of Epsom salt in a small tub filled with warm water. 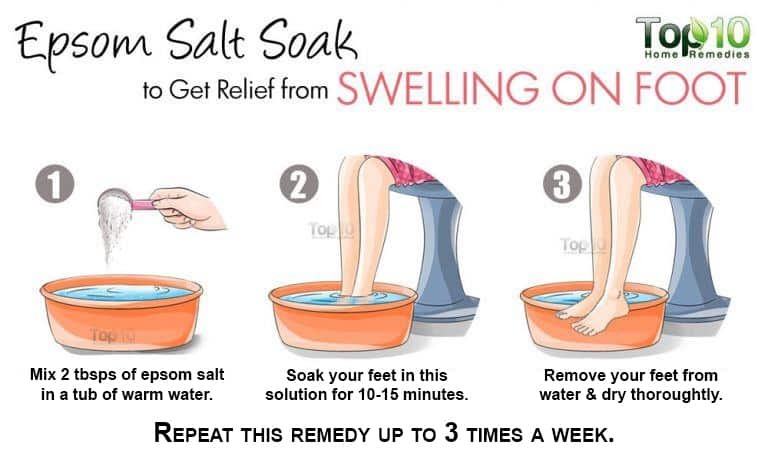 Soak the affected area, such as a foot or hand, in it for 10 to 15 minutes. Repeat up to 3 times a week. For larger injured areas such as the legs or shoulders, you can soak your whole body in an Epsom salt bath. Mix ½ cup of Epsom salt in your bathtub filled with warm water and soak yourself in it for 15 minutes. Do this twice a week. 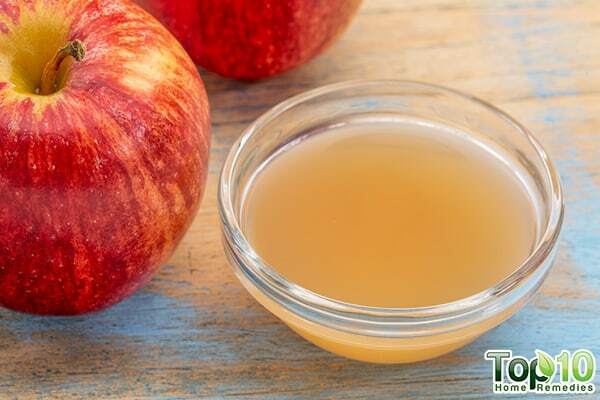 Apple cider vinegar is another good home remedy to reduce swelling. Its anti-inflammatory and alkalizing properties together with its potassium, calcium, and other essential mineral content help in reducing the pain and other signs of inflammation caused by injury. Mix equal parts of raw, unfiltered apple cider vinegar and water. Warm up the solution in the microwave, and then soak a towel in it. Wrap the moist towel around the affected area and let it sit for 5 to 10 minutes. Repeat twice daily. 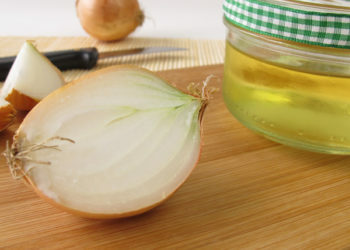 Also, mix 1 to 2 tablespoons of raw, unfiltered apple cider vinegar in a glass of warm water. Add a little raw honey and drink this solution twice daily. Rest, Ice, Compression, and Elevation (RICE). Rest, Ice, Compression, and Elevation (RICE) | Michigan Medicine. https://www.uofmhealth.org/health-library/tw4354spec. Accessed October 13, 2018. Block JE. Cold and compression in the management of musculoskeletal injuries and orthopedic operative procedures: a narrative review. Open Access Journal of Sports Medicine. https://www.ncbi.nlm.nih.gov/pmc/articles/PMC3781860/. Published 2010. Malanga GA, Yan N, Stark J. Mechanisms and efficacy of heat and cold therapies for musculoskeletal injury. Postgraduate medicine. https://www.ncbi.nlm.nih.gov/pubmed/25526231. Published January 2015. Accessed December 2018. Hansrani V, Khanbhai M, Bhandari S, Pillai A, McCollum CN. The role of compression in the management of soft tissue ankle injuries: a systematic review. European journal of orthopaedic surgery & traumatology: orthopedie traumatologie. https://www.ncbi.nlm.nih.gov/pubmed/25649317. Published August 2015. Herrington L, Al-Shammari RA. The effect of three degrees of elevation on swelling in acute inversion ankle sprains. Physical Therapy in Sport. https://www.sciencedirect.com/science/article/pii/S1466853X0600099X. Published October 20, 2006. D’Angelo EK, Singer HA, Rembold CM. Magnesium relaxes arterial smooth muscle by decreasing intracellular Ca2 without changing intracellular Mg2 . Journal of Clinical Investigation. https://www.ncbi.nlm.nih.gov/pmc/articles/PMC295901/. Published June 1992. My right foot injured a month back on 15th jan, no wound or fracture. There is still swelling on top of foot. I used compress bandage but still there is swelling. How long will it take, though there is luttle pain by forced touching. Should i use ice or warm salty water in future.? @Satya. U need an X-ray as u may have a Tear. my beloved met with an accident on last Friday, its just a few days after the accident.. For the past three days he is having a bed swelling on his right ankle. I already gave him the cold and hot compress almost for the past two days non stop! He is being under medication but still his right ankle is swelling. What should I do to cure the swell?